This is my 7th cancerversary. And I am beyond happy to be here to type those words. If there’s something I have learned these past years about cancerversaries, it is this. They are pretty much all the same but they are all different too. Each year, similar emotions are stirred. The memory of those words “highly suspicious of cancer” never fades, nor does the memory of feeling petrified. Petrified in its most pure sense, being frozen by fear, immobile, terrified and numb. The feeling of loss, that comes when faced with mortality. The knowledge that things can never return to they way they were before diagnosis. Yet, in seeming contradiction, I have found each cancerversary different. Some I have marked in quiet reflection and thankfulness. Some more analytical than others, and some more intense than others. None, not one has been celebratory. October is brimming with memories and landmark days as well as being compounded with the irony of Breast Cancer Awareness Month so I am surrounded by reminders both in my own head as well as all around me. October also marks the time of the Big Check. Usually I roll up at Counter No 2 of my familiar Bangkok hospital, am greeted like a long lost friend and find myself on a conveyor belt of blood draws, scans, x-ray, mammo and vitals before seeing my dream team who unravel the mysteries held in the various tests. That’s usually when the tears start, while sitting waiting to wrap up the final paperwork and leave the hospital. An overwhelmingly emotional mix of relief, grief, release of tension as I find myself connected, sometimes a little less directly than others, with NED, No Evidence of Disease. This year is very different. There is no seven year itch which leads to a rupture in the long relationship with my wonderful team in Bangkok. The reality is that I am no longer an hour’s flight from this team which has looked after me so well for so many years. I am now on Africa soil and would need to find a new dream team in the region. I had considered returning for one final Big Check in October but the unexpected health hiccup in August meant that was unrealistic and a long haul trip unwise. However, the extra time in the UK meant that was able to hurriedly arrange a check up. This was far less detailed than the Bangkok checks, protocols being very different and incorporated mammogram and bloodwork. And no tumour markers. We know these are controversial, and not considered reliable. I know that, yet the yearly or twice yearly marker check is one I cling to as I find reassurance in stable results. It has been strange starting my story at the beginning with new specialists and support teams. It was unsettling not to have a physical examination. I almost feel that I need to go through the intensity of so many tests to be able to breathe when I come out the other side, always knowing that breathing is a luxury and not guaranteed. This year, my bloodwork was fine. Kidney and liver functions and the other key bloodwork all normal. Slightly anaemic, unsurprisingly given the bleed just beforehand. And the mammo was also unremarkable. All reassuring and welcome news delivered over the phone just a few hours before I boarded my flight to return to Africa. I had half guessed this though. The mammo had been carried out a few days earlier, and the oncologist had my phone number and knew I was leaving the country. I knew that if there was something worrisome, then I would have received a call much earlier. Though my heart did stop when her PA called me with the opening words “unfortunately…” This was not related to the tests, thank goodness, but to difficulty in getting me a replenishment of Femara before I departed! So there was no moment when I was shooed out of Dr W’s door to be banished until the next round of checks. No release of tension, nor tears. Perhaps the seven year point coincides with this new landscape and brings a new perspective even to the Big Checks. So with the Big Check behind me, friendship maintained with NED, how do I mark this seven year cancerversary? I always have something to say, being a “remember-the-date” kind of girl and October 2 with its cancerversary status is one firmly etched in my mind. This morning Facebook welcome me with a swathe of reminders about the previous posts I have written on this day over the past years. Last year my Big Checks fell on the same day and date as the diagnosis six years previously and I focused on the similarities and differences of those appointments. The previous year marked five years after diagnosis, a time scale which is widely held to be a magical milestone but which is far more complex. At four years, I was in a contemplative mood with few words but a great deal of thinking and remembering, noting that this was “a day of recognition, quiet reflection and gratitude for a a present which is precious and fragile“. On the third cancerversary I wrote about the line in the sand which you cross when you hear the cancer words. That line which marks the time before and the time after. At the two year point, I dwelt on what I had lost and what I had gained, much of it intangible and psychological. All of it real and intense. But the very first cancerversary is one which retains its own particular character. That one year mark was an important one, especially given that I did not think I would see Christmas beyond diagnosis, let alone a whole year. 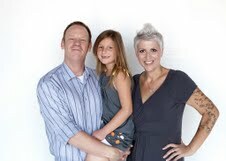 Life had changed beyond recognition and I wanted to tell cancer a few things. So I wrote a letter to cancer. I re-read it this morning and realise that in fact, much of this sentiment holds true years later, so I have decided to share the letter again. It is a year since you came into my life and it’s about time I told you what I really think. You were uninvited. And unwanted. And unexpected. You have changed my life beyond belief and it really will never be the same again. I had no choice about your unwelcome arrival, you didn’t give me any chance to opt in our out. You were just there. The first time I realised you might be there I remember a terrible fear. It was late September and I remember thinking that I would not see that Christmas. The thought of you kept me awake at night, my mind veering between hope that there was another medical reason for your symptoms, and sheer terror that indeed you were the cause. I admit I had never really thought that you would try and invade my life, after all you have not troubled our family before and I naively thought that you preferred certain genetic and family traits. So when I was told that you were there I was shocked and surprised. And terrified. You are such a destructive force and that meant I had to endure destructive treatments. For my survival I was trapped in an overwhelming battle between massively destructive powers. I had to lose parts of myself to cut you out of my body. My body hosted a long and violent battle between you and the toxic chemotherapy and the rays of radiotherapy as they sought out any trace you might have hidden as a seed for the future. I know that I was left sick, exhausted and very weak but that was worth every ounce of suffering to know I tried everything in the hands of the powerful team I have to banish you. While this has taken me through a horrible journey, when I have had numerous side effects, lost my hair, caught pneumonia, lost much of the use of my left arm and generally felt very ill, it has brought me some special things too. The relationships with those near and dear have grown and strengthened and we have cherished time which we might otherwise have squandered. While it was my body which you invaded, you touched the lives of many beside me with your heavy dark hand. I have had to face up to some horrible and unpleasant procedures and been able to find a strength and resilience that I had no idea I possessed. I have connected with many other women all around the world whose lives you have also invaded and we have shared the most private of details from the terrifying through to the hilarious. We have laughed at your expense, even though we acknowledge that you have had possibly the bigger laugh. Time will tell if you have the last one. While I value and treasure these factors which I found through you, don’t get any ideas that this might endear me to you. No, I CAN’T EVEN BEGIN TO LIKE YOU! I get your point and I will continue to do everything possible to keep you as far from me as possible. I am still frightened of you because you are such a destructive and determined force. You are also horribly sneaky and I know how powerful you are. I know that I have always to be vigilant because I don’t know when or where or how you might try another attack on me. I resent you because I am no longer able to think of the future without worrying about you coming back. I resent you because I now live my life through what I call the “cancer lens”. Even if I don’t need to take you into account in what I do, you have changed the way I see everything. You could say that instead of seeing life through rose tinted spectacles, I see through pink breast cancer spectacles. I might not particularly like it, but I recognise, accept and live with it. So I will be keeping a very keen eye open for any attempts you make to sneak back into my life. And trust me, if you do try any comeback, you will be treated to exactly the same welcome. This makes me think of the French expression “plus ça change, plus c’est la même chose” which translates along the lines of “the more things change, the more they stay the same”. Indeed they do. The landscape is new yet somewhat familiar in certain elements. The perspex plates which cause both physical and emotional discomfort in mammogram machines, the needles and skilled fingers which try to find blood in reticent veins and the anxious waiting all easily cross continents. Yet, the team now looking after me, and the systems and procedures are very new as is the African soil, the flowers and the birdsong. Indeed in these times, there is always something to take us back to that which truly counts. 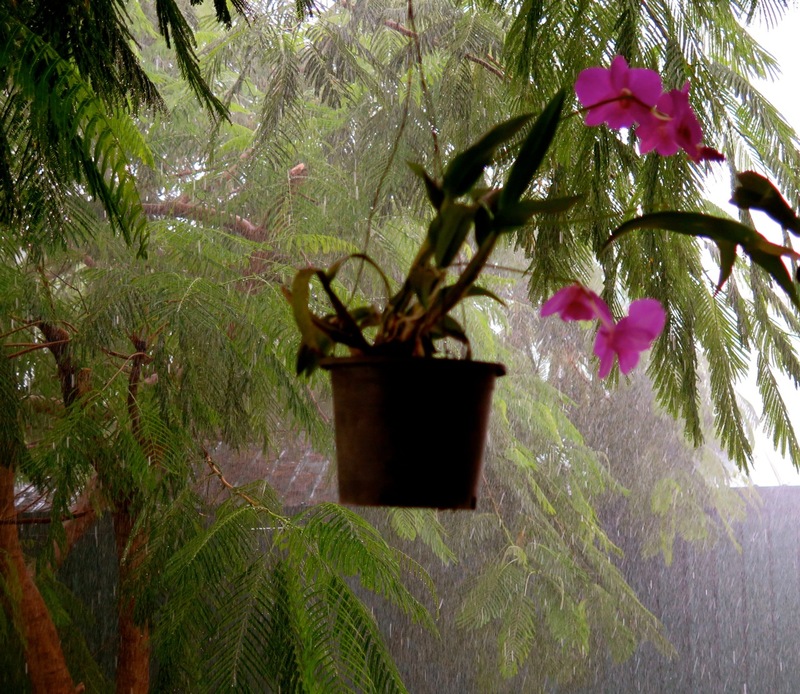 The dry season which was underway when I arrived in Africa has given way to a short rainy season. 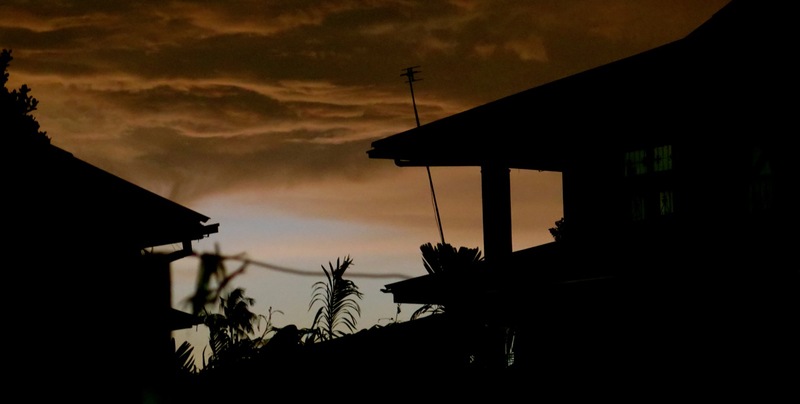 It is less humid, and far less warm than Yangon but the thunderstorms which light up the skies are reassuringly constant in their dramatic nature. The lightning reveals the silhouettes of a thousand hills and causes electricity lines to blow. In the fresh post rain air this morning, I spotted on the rain-sodden grass an unexpected splash of colour. There in the middle of the grass was a brand new flower. As if placed there for this day of note. A perfect, timely reminder to cherish the past and embrace the new. When I was diagnosed with breast cancer in 2009, I experienced a variety of reactions. Shock. Disbelief. Distress. Sadness. Perhaps a little judgement, what had I done to cause this? However, not one person said to me, “So what’s that then? Breast Cancer? Never heard of it!” We have a very long way to go, of course, towards real levels of awareness of what Breast Cancer is and there is a wide spectrum of understanding, ranging from “the-easy-cancer, guaranteed-curable-if-found-early and you-can-live-without-a-breast-anyway” through to “oh-my-goodness-cancer-you’re-going-to-die”. But that is another story and not for today. The story for today is about Mesothelioma. Put up your hand if you have heard of Mesothelioma? (My hand is half raised, I have kind of heard of it since my own diagnosis and connecting with the cancer blogosphere). Fine. Now put up your hand if you know what it is? (OK, you’ve got me there – I really don’t know……..). A few weeks ago, I received a comment on one of my posts, from Cameron. Now, bloggers receive all sorts of comments which don’t quite make it to the “approve” button. I will always approve a valid comment, and while some are obviously spam or robots (and the source of many a giggle) there are some which are a little bit more difficult to figure out. Cameron’s was one of those posts, one which takes a little effort to work out. Hi Philippa! My name is Cameron …. and I had a quick question for you! I was wondering if you could email me at your earliest convenience ………. I greatly appreciate your time!! What I did not confess to was that my own levels of awareness were dire. I had no idea what kind of cancer Mesothelioma is and am not even sure how to pronounce it. This is a post of self education as much as broader awareness raising. Mesothelioma is a complex cancer distinguished primarily by three factors: rarity, cause and aggressiveness. The disease is one of the least-diagnosed cancers, and it is often misdiagnosed. Mesothelioma attacks the lining of the body cavity called the mesothelium. The cancer is caused by exposure to asbestos or materials containing asbestos.. Between 2,500 and 3,000 new cases of mesothelioma are diagnosed each year in the US. On average, those diagnosed are given between 9 and 12 months to live. In the UK it accounts for only 1% of cancer diagnoses, but 2% of cancer deaths. It is rare, aggressive and particularly lethal. I had no idea. There are three recognised types of Mesothelioma. Pleural, peritoneal and pericardial mesothelioma. 80% of all mesothelioma cases occur within the lining of the lungs. Peritoneal mesothelioma occurs in the abdominal lining, and pericardial mesothelioma in the heart’s lining. I didn’t know any of that. The reason Cameron is so passionate about raising awareness and understanding around mesothelioma is clear. His wife, Heather was diagnosed with mesothelioma in 2005 and given 15 months to live. While mesothelioma typically affects males more than females and most commonly diagnosed in those between 50 and 70 years of age, Heather was 36 years old and the couple had a daughter of 3 months. You don’t need me to provide the terrifying maths facing the young family. However, this is a story of hope. Heather and Cameron found specialist treatment options and Heather’s story is here. Today she is mother, wife, advocate and alive! And today, September 26 – is Mesothelioma Awareness Day. I have learned a great deal about this rare and dangerous cancer. The very high profile of October as Breast Cancer Awareness Month can overshadow very rare cancers and cause division. The reality is that any cancer diagnosis is potentially lethal, and every diagnosis is traumatic. With a cancer which has a higher profile, I find benefits, but I also find assumptions which are not based on fact. As a person who has heard words which chilled me to the bone – “this is highly suspicious of cancer” and stepped over an invisible line into a new and terrifying territory, I reach out with a hand of solidarity. ALL cancers are evil and steal so many lives. Let us work together in the movement to understand and eradicate all cancers. October on the breast cancer blogosphere has often been tense and as we step gently into November I feel a release of that tension. There has been much discussion about pink and whether pink and the pink ribbon are appropriate, exploitative and ineffective. A great deal of focus has been on moving conversations forward towards action and education and away from awareness. Awareness is yesterday. Awareness is unneeded. Awareness misses the point. 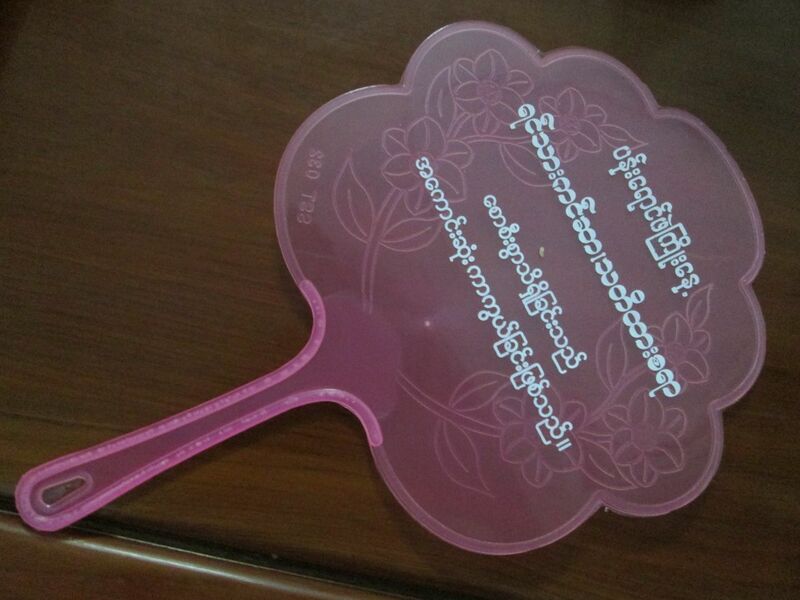 Many bloggers who are usually very active and vocal took a recess during October. Others used the opportunity to shout. There has been a great deal of articulate, passionate and thought-provoking debate. I struggle with these discussions. Not because I disagree with the concern that pink campaigns focus on profit and an unbalanced view of breast cancer. I find it completely inappropriate that certain products claim to support breast cancer initiatives and often a tiny proportion of the proceeds or profits is used for breast cancer work. Nor do I struggle because I find some campaigns distasteful – after all a certain shocking image even prompted me to leap off my comfortable fence and rant! No, my issues with the feisty debate stems from the fact that I have a particular perspective on breast cancer, awareness and equity from my place on the planet. I see and hear, and try to understand, the significant different levels of awareness and the very different concerns which people have in my part of the world. I struggle with the fact that I had access to excellent care and treatment and a reasonable level of understanding of breast cancer yet a woman I might sit next to in the course of my life and work here has a very different level of awareness, considerable traditional taboos and for whom access to care and treatment is not easy. The discussions in the wider blogosphere are relevant and critical. But they often do not have relevance from where I am standing. This is something which I have been struggling with since I stepped over the line in the sand into breast cancer world. Inequity in any form ruffles my feathers and my personal and professional life are driven by this passionate need to play even a tiny role to cause any tiny shift in this balance. But apart from the blog, it is difficult to see what I can really do in my neck of the woods. So recently, I learned of an initiative underway to bring women and men together, raise awareness and understanding about breast cancer and of course I leapt at the opportunity. There are a very small number of expat/international women I know here who have been through diagnosis and treatment and who are currently here so we came together to look at two things. Firstly, how we could support and contribute to the efforts of the local group, and secondly how we could connect as a small group ourselves. We contacted the key folks involved in the initiative here and asked if we could support. We know that our understanding and experience is different, but we also know that we have all heard the same or similar words. We have all felt that fear when confronted with our mortality and the dread of aggressive, difficult treatments. As individuals, of course our experience is different but this is compounded considerably by our backgrounds. So, it is complicated. What follows is my understanding and reflection, and I know it is more shallow and superficial than I would like. But it is a start in this broader attempt to convey just how different our cancer experiences are, yet how much we have in common. No matter where we are on the planet. And how critical it is to respect these, no matter how much or little we understand. Our cultural reference points bring differing levels of understanding wherever we are. I quickly learned that it was even more complex and subtle here than I had imagined. Many people were hesitant or uncomfortable to talk openly about their cancer, or even to be identified as having been diagnosed. Gentle conversations gradually helped us, outsiders, to understand that there is a significant stigma associated with cancer. Belief grounded in karma means that a cancer diagnosis seems to bring with it a judgement that this is a punishment for a wrongdoing either earlier in this life or a previous one. There also are important issues over privacy and sharing private information, similar to the situation which Kirsty discussed in her post from Timor-Leste where the woman she spoke of was unable to raise her concerns with a doctor due to shyness. So it has been a path which we have been treading along gingerly, trying to understand unspoken concerns and beliefs in solidarity. Our initial aim has been to support the group in organising and promoting a Pink Ribbon Awareness Day which was being planned. 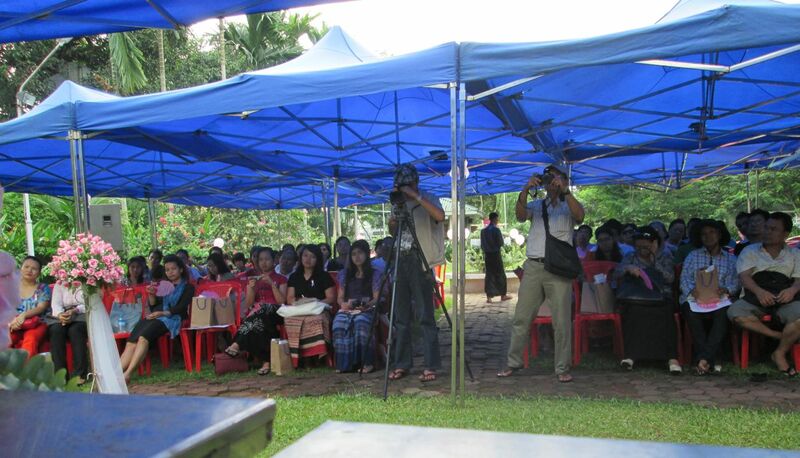 And that is the event which was held last Saturday and which I promised to share details and reflections. 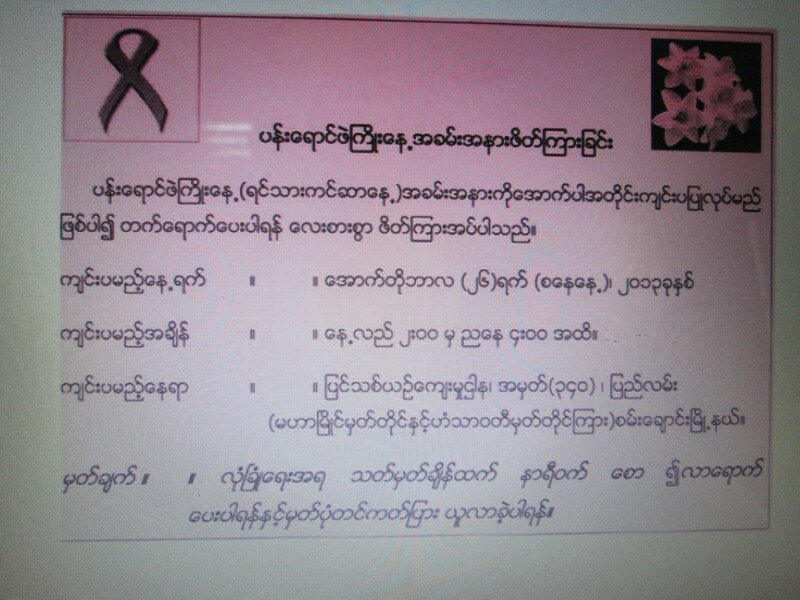 In preparation for the day a few women worked together to prepare a leaflet in Myanmar language, sound in information yet sensitive and appropriate to the context. 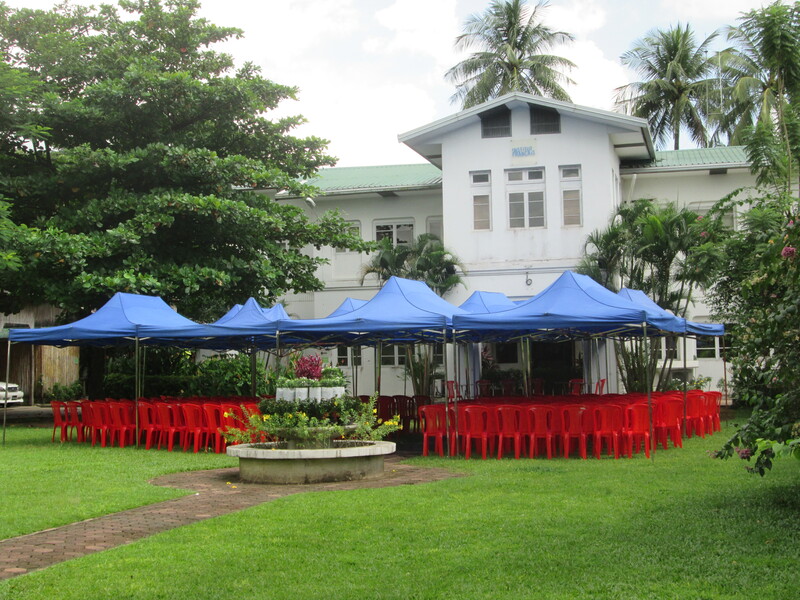 We took care of the practical and logistical arrangements such as venue, refreshments, shade, seating and translation. We prepared for our own roles on the day and did our best to spread the word. Although rainy season should be nearing its end our planning had an added edge with the promise of thunderstorms and the day did indeed start under a very moody sky. The message which the group were anxious to convey was to dispel the utter fear of breast cancer which causes many not to seek medical advice. The message that a diagnosis of cancer is not necessarily a life sentence and that early detection is critical. I found myself struggling to a certain extent, knowing the importance of not reinforcing the belief that early detection guarantees that the cancer will be “cured”. But the discussions soon showed how complicated this is in the global context and the importance of that very early detection message here. For various reasons, potential breast cancer symptoms are often presented at an advanced stage when prognosis is much poorer. Generally, if detection were earlier here, then many lives would be saved. Many, many women and men do not know many of the symptoms of breast cancer. Many are afraid to know – treatment is not easily accessible or affordable. Many prefer to see if symptoms disappear on their own, and take traditional medication. By the time it is clear that the symptom is not going away, the disease could be much more advanced. Many are afraid of the treatment itself, or do not trust it and unsure of where to get reliable information. So it is complicated indeed. The group decided to have a “programme” which would provide information, encouragement and the opportunity to ask questions as well as learning how to do a self examination in a private space after the main discussions. 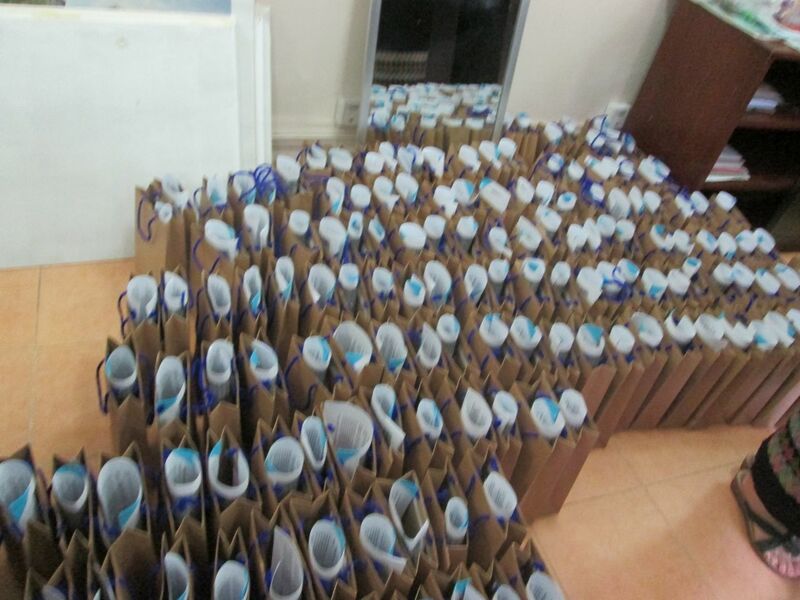 We provided a “goodie bag” with information leaflets and fans and ribbons were provided for each participant. After a short introduction, a panel was introduced of four women who shared their experiences and answered questions put by a facilitator. The four women comprised two Myanmar women, one Australian and one Scot. It is probably not hard to guess who the Scot might have been! We each described our own experience, focusing on how we felt when we discovered the sign that we might have cancer, what we did, what was our treatment and how did we cope. We were also asked to say how much we knew about cancer before our diagnosis. I was asked if I had had treatment options, and who decided what my treatment would be. We were also asked who broke the news to us that we had cancer – was it family or the doctor? It seemed that the Myanmar participants shared their concerns with friends or family some time before seeking medical help on their advice. One spoke of the difficulty in finding an oncologist and when she did, was not comfortable to share her concerns with a male doctor and it took further time to seek a female oncologist. After we had spoken and answered individual questions, a gentleman sitting in the front row was invited to speak. We very quickly learned that he had been diagnosed with breast cancer and he shared his account with enormous openness and detail. He described finding blood on his shirt one day and when he sought medical advice, was highly surprised to find that this was breast cancer. From my place in the panel, I could not see him clearly, but there was no mistaking what was happening when he started to unbutton his shirt so that people could see his scar. Following our own stories, there was the opportunity to ask questions. Pieces of paper had been distributed so that people could write their questions down and not feel embarrassed or shy in front of the large group. The panel was joined by one of the international doctors who gave up his Saturday afternoon to provide accurate and up to date information and answer questions from a medical perspective. • Are you more likely to have breast cancer if your breasts are very large or very small? • What were your eating and sleeping habits before you had cancer? • What is meant by stages and grades of cancer? • Is it more likely to have cancer in the left than the right breast? • What counselling support did you have to help you after diagnosis? • How long does chemotherapy last and how much does it cost? • What different treatments are there and how much do they cost? • Are there options other than surgery for a tumour? Thus, as the discussion ensued I realised that the messages of early detection and awareness of signs and symptoms are critical in this context as many women will seek support and information from friends and family long before consulting a doctor. Thus many present very late and prognosis is much poorer. It is so important to understand and respect the differing places we are all coming from. I know that there is in many places pink and pink ribbon fatigue. 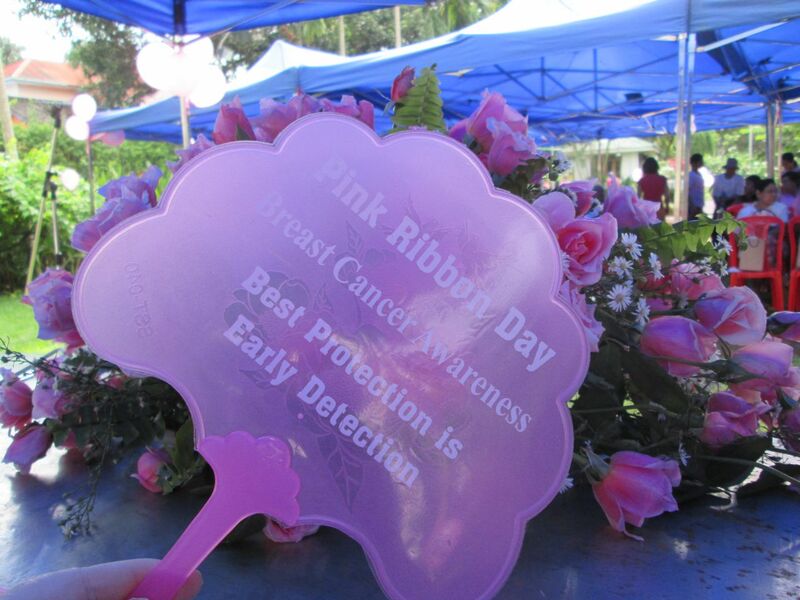 I know that there are calls that the pink ribbon has outlived its use. It is evident that pinkness masks the ugly reality that is breast cancer. I understand these but from where I am I do believe that there is an important place for a unifying pink ribbon. It is sad that the ribbon has been abused and exploited in many places. It is critical to recognise and respect the reality that the pink ribbon excludes the most important group of the breast cancer community – those with metastatic cancer. But it is complicated. 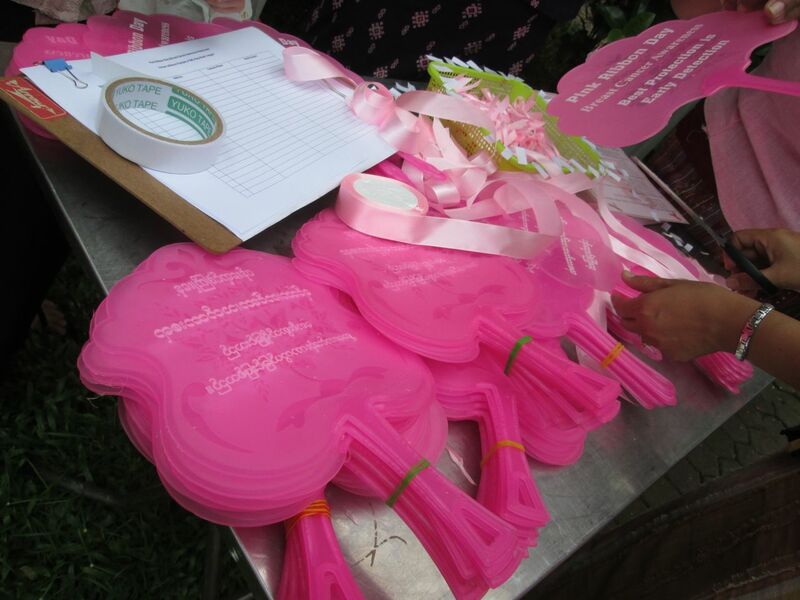 The organisers of the event on Saturday were more comfortable working on the symbolic pink by making ribbons, and setting up flowers and providing fans with a message of vigilance. They were far less comfortable sharing personal details or being identified as having been diagnosed. And as outsiders to the context, we must respect that. Cancer cells do not care what our citizenship is, they are programmed to destroy. The major surgery often required to eradicate tumours is physically disfiguring on any body and psychologically destructive on any mind. Chemotherapy does not care if our hair is fair or dark, long or short, curly or straight, thick or fine – it will still fall as a result of many chemo regimes. Cancer is a psychological diagnosis as much as a physical one, no matter where on the planet we are. And wherever or whoever we are we must respect and recognise how much we have in common and how much differs. We may we have moved from Breast Cancer Awareness Month into Movember, but there is still the issue that awareness is important but what we really need is a cure. That is absolutely fundamental, indisputable and critical. And that is the serious part of this post. Moving to a less serious slant, I want to tell you about something that happened yesterday. When I was in one of the markets in town, my eye was caught by a display of sandals which were being promoted as “Slippers for health”. 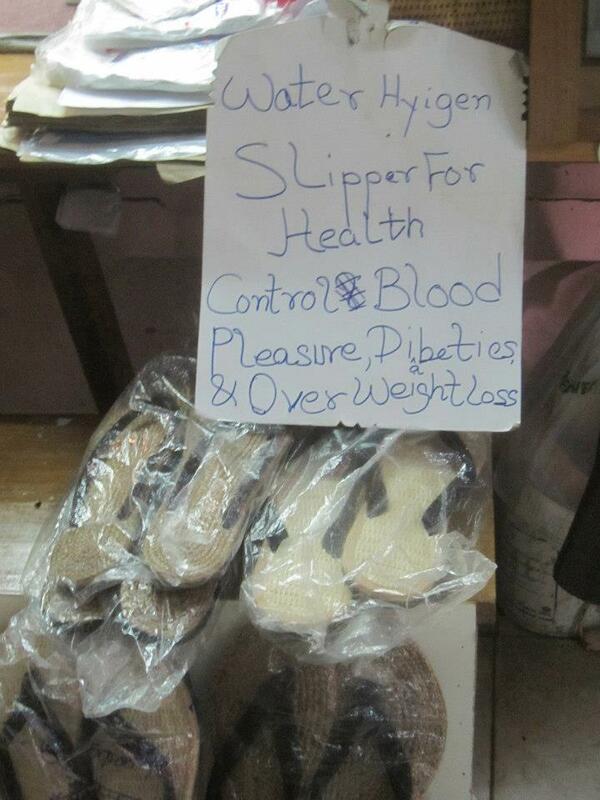 These slippers claim to bring all sorts of health benefits! Is an elusive cure under our noses? Or moreover, under our feet? Perhaps I should buy a pair of these slippers and carry out a clinical trial, with plain slipper-wearers as the control group? This reminded me very much of the time when I was watching TV when I lived in Nepal. A number of commercials were showing in between programmes, and one came on advertising similarly amazing footwear. The slippers in this commercial had magnets implanted in their soles, and promised stimulation of height growth. There was a scientific diagram showing how the magnets stimulated the pituitary gland (I think..) which in turn tricked the body into growing taller! It promised a full three inches height growth in two months! Now I am one of the shortest adult people I know, so the thought of sandals like these was very exciting. So exciting that I was prompted to …… buy a pair? No, I could not resist shaping it into a short and fun poem. and soon I’ll be much taller.. The winds of change are definitely in the air. The days are becoming drier, more sunny and very hot. There is still a good amount of rain, some torrential, but the skies are looking different. There are swathes of blue, punctuated by white, grey and inky black cloud formations. It is a beautiful time of year, the vegetation lush and rich from the rains but now set amidst bright sunshine and clouds with character and feist. As I discussed in my last post too, it another season is newly underway. Personally, it is my anniversary season. In only two days time I will silently and sombrely recall the words which changed life forever for me and those close to me. The “this is highly suspicious of cancer” words. Those days were followed rapidly by surgery, pathology reports, chemo and all the attendant extras that these entail. It is a rough and stormy season and one which I will be glad to be on the other side of, just like a rough storm indeed. It is also a season which is becoming increasingly divisive within what is a close and highly supportive online (and offline) community of breast cancer veterans. (Hmm – apart from the war and fighting associations – I think I might prefer veteran to survivor as a term? A veteran being anyone who has crossed over the “you have cancer” line…. just thinking out loud here). 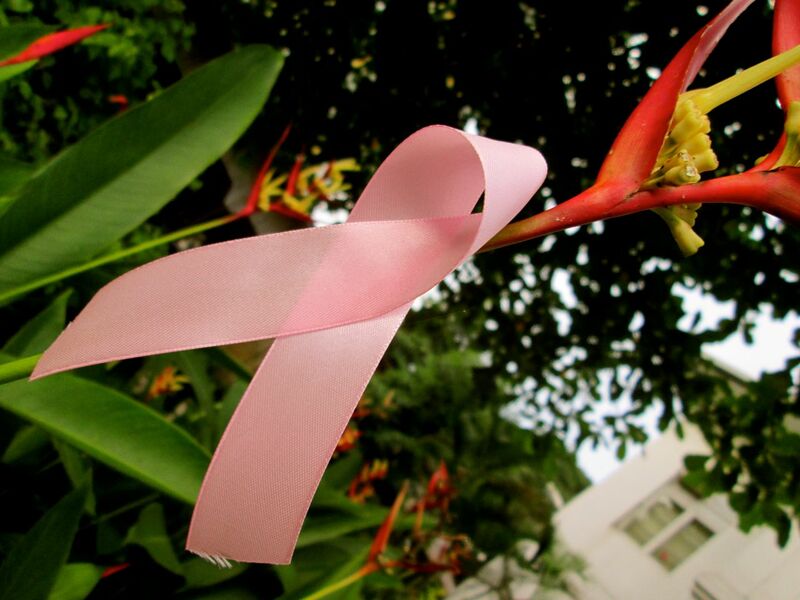 The season is of course Breast Cancer Awareness Month (BCAM) – often called Pink October. I personally believe, looking at this from a global perspective, that there is no right or wrong in terms of BCAM. The context varies wildly and we cannot prescribe for another situation. I very much disagree with hijacking a cause or issue for profit, but will never tire of trying to highlight the very different context here and the challenges for, particularly women, in the developing world. Many winds and crosswinds are blowing during October. So while these serious winds of change are sweeping through our lives, what better time to step back and refresh the visual image backing the blog. This time I have selected an image from my travels again, but the elements which I wish to share are ones which are universal. 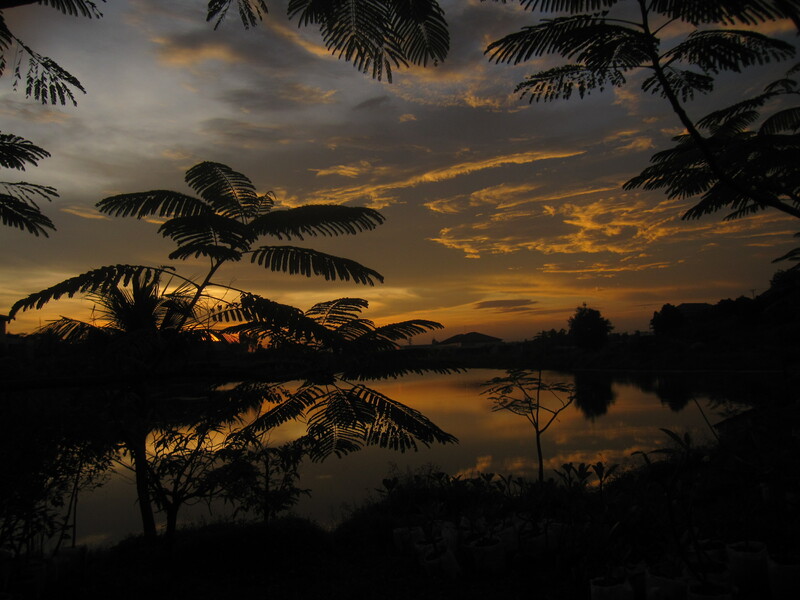 A sinking sun against a sky scattered with cloud formations, reflected on the water. Foliage silhouetted against the darkening sky. The mood of the sky captures the winds of the changing season and the promise of dry days and retreating rains. This is the complete image, and very shortly (as connectivity allows) the image will appear as the background for the next few weeks. It can be very confusing listening to a Scottish person speaking. We use many words and expressions in their own unique way and often these are not abundantly clear. For example, we go to the shop or supermarket for our messages. Does that sound strange? Well, it is not strange to us at all. It simply means shopping, particularly our grocery or food shopping. Another word we use a lot is “piece” and you would often hear talk of a cheese piece, a piece and jam (jeely piece) or be asked “what’s in your pieces today?” To us, a piece means sandwich,. So we also have piece-boxes which are used for packed lunches. Not quite like the tiffin pot which holds hot food and meals, the piece box holds sandwiches and maybe an apple! One deliciously expressive word we use a fair bit is “greet”. It has nothing to do with the broader English language definition of “to salute or welcome in a friendly and respectful way with speech or writing, as upon meeting or in opening a letter” Oh no – we use it rather it as a colloquial term for crying or weeping and it also has the sense of complaining or grumbling. It is not a flattering term. Greeting is not the word we would use for a dignified, composed weep. And it is none too sympathetic or generous. The image conjured up of someone greeting is of a contorted face, scarlet and probably snottery, and a significant noise volume attached to it. To have a greeting face is not something to aspire to at all, with its associations of crabbitness and grump. (Crabbit being another wonderful expression in Scottish slang for grumpy or miserable). For example, this description from the Scots Language Centre quotes the use of “greeting face” which is most definitely not a compliment. So that is the greeting. But what is the season? Well, for me it is the season of memories, milestones, landmark days and anniversaries. We are also on the threshold of Breast Cancer Awareness Month which in itself creates a considerable stooshie around the globe. 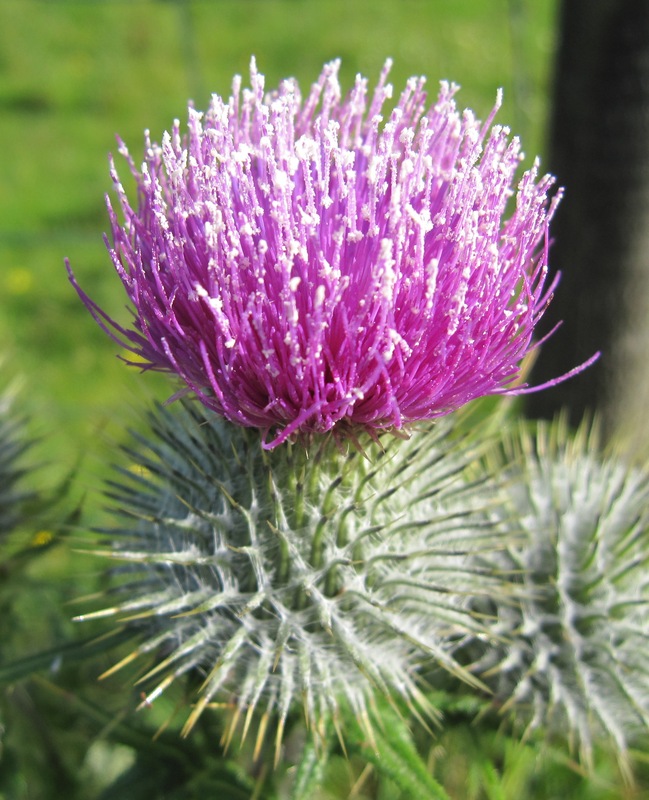 (A stooshie being another wonderful Scots word for a commotion, rumpus, or row, or a state of excitement or anxiety; a tizzy). And there is one serious stooshie on the horizon across the blogosphere and breast cancer world. Thoughts on that stooshie are for another day, today my thoughts relate to that season as it relates to my own experience. Today marks the start of this season. For it was 23 September 2009 when I discovered the lump and life as I knew it took a turn for the very different. The landmark days come hurtling at me after that, with October 2 marking The Day I Found Out, my Cancerversary. That was the day I heard those life-changing, burned-onto-my-memory words “this is highly suspicious of cancer”. On October 5 I had my surgery, lost my left breast along with its tumours, a heap of lymph nodes and their nasty cells and gained Twang Arm. Although I spent most of the day unconscious, it is certainly a day I will never forget! On 21 October my portacath was implanted in time for the first chemo on 23 October. Exactly a month after the day I found the lump. So it is a season for greeting, remembering, reflecting and to a certain extent, re-living those traumatic days of October 2009. Add to that the annual Big Check with the attendant scans, examinations and appointments and you have a very sensitive season indeed.